Hurricanes are storm systems of at least 74 mph that rotate around a center of low pressure and are fueled by relatively warm ocean waters. These storms are known as typhoons in the western Pacific and cyclones in the Indian Ocean. 1. Tropical disturbance: A cluster of showers and thunderstorms with little or no circulation. 2. Tropical depression: More organized than a tropical disturbance. Definite circulation. Wind speeds of 25 to 38 mph. 3. Tropical storm: Wind speeds of 39 to 73 mph. 4. Hurricane: Wind speed over 73 mph. The average life span of a hurricane is 3 to 14 days, although some last much longer. 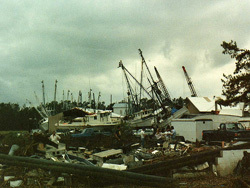 Hurricane John lasted 31 days during August and September in 1994. Winds of 74 to 95 mph and storm surges of 4 to 5 feet. No significant wind damage to well constructed buildings. Some damage is done to poorly constructed signs. 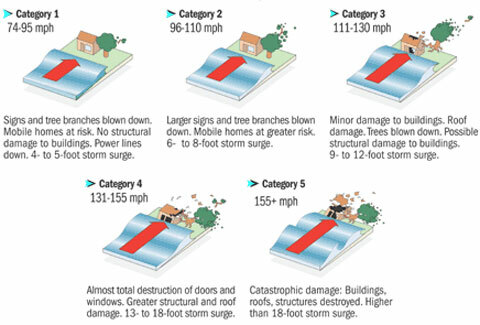 Wind damage primarily occurs to mobile homes, shrubbery, trees and foliage. Low-lying roads are inundated by storm surges. Minor pier damage occur. Winds of 96 to 110 mph and storm surges of 6 to 8 feet. Some roofing material, doors, windows of homes and businesses are damaged by winds. Considerable wind damage to mobile homes and vegetation. Low-lying roads are inundated by storm surges. Considerable damage done by storm surges and waves to piers. Small craft in unprotected anchorages break from moorings. Winds of 111 to 130 mph and storm surges of 9 to 12 feet. Winds cause structural damage to homes and utility buildings with a minor amount of curtain wall failure. Mobile homes are destroyed. Storm-surge flooding destroys many smaller buildings while large buildings are damaged by floating debris. Terrain continuously lower than 10 feet above mean sea level is flooded. Winds of 131 to 155 mph and storm surges of 13 to 18 feet. More extensive curtain wall failures with some roof failure on homes. Major damage to lower floors of homes and businesses from storm-surge flooding. Terrain continuously lower than 15 feet above mean sea level is flooded. Winds greater than 155 mph and storm surges greater than 18 feet. Roof failure of many homes and businesses. Structural failure of many small buildings. Storm-surge flooding of areas lower than 20 feet above mean sea level. Meteorologists set June 1 to Nov. 30 as the Atlantic season because while a few hurricanes have formed outside that window, most happen in summer or fall, when waters are warmest. August and September historically have been the busiest months. The eye of the hurricane is the innermost portion of the storm. This zone is surprisingly calm with little or no wind. Within the eye, the skies are often clear, despite the fact that winds and clouds continue to rage around the edge of the eye. The eye is not always in the center of the storm. Sometimes it turns or moves in various directions with the storm itself, which continues to move forward on its own course. 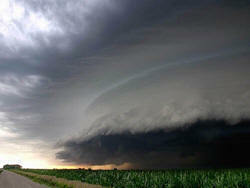 A storm becomes a tropical storm, and receives a name, when its winds reach 39 mph. It becomes a hurricane at 74 mph. Short, given names are used to avoid confusion about what storm is being described. Six lists are used in rotation, with a name for each letter except Q, U, X, Y, Z. Names of very severe storms, such as Katrina, are retired. Among hurricanes to strike United States, Katrina ranks a distant third in terms of deaths, while the United States overall has had far fewer hurricane deaths than Caribbean and Central American countries. Katrina set the new benchmark for costliest hurricane, nearly doubling the previous record, which was set by Andrew in 1992. The estimates are in dollars adjusted for inflation to the year 2004. The United States has seen dozens of Category 1-3 hurricanes make landfall since 1851, yet only seven Category 5 storms - and four of those were in 2005. A hurricane watch is issued when hurricane conditions are possible within 24 to 36 hours. A hurricane warning is issued when hurricane conditions (winds of 74 miles per hour or greater, or dangerously high water and rough seas) are expected in 24 hours or less. Contact the local emergency management office or American Red Cross chapter and ask for the community hurricane preparedness plan. This plan should include information on the safest evacuation routes and nearby shelters. Include all family members in a plan. Teach them how and when to turn off gas, electricity and water. Teach children how and when to call 911, police, or fire department and which radio station to tune to for emergency information. Make sure all family members know how to respond after a hurricane. Ask an out-of-state relative or friend to serve as the family contact. After a disaster, it's often easier to call long distance. Make sure everyone in the family knows the name, address and phone number of the contact person. Learn safe routes inland. Be ready to drive 20 to 50 miles to a safe place. Have disaster supplies on hand: flashlight and extra batteries, portable, battery-operated radio and extra batteries, first-aid kit and manual, emergency food and water, non-electric can opener, essential medicines, cash and credit cards, sturdy shoes. Make arrangements for pets, which may not be allowed into emergency shelters for health and space reasons. Contact your local humane society for information on local animal shelters. - Listen to a battery-operated radio or television for progress reports. Check emergency supplies. Fill your car with gas. Bring in outdoor objects such as lawn furniture, toys and garden tools, and anchor objects that cannot be brought inside. - Secure buildings by closing and boarding up windows. Remove outside antennas. - Turn refrigerator and freezer to coldest settings. Open only when absolutely necessary and close quickly. - Store drinking water in clean bathtubs, jugs, bottles and cooking utensils. - If you have a boat, moor it securely or move it to a designated safe place. Use rope or chain to secure boat to trailer. Use tie downs to anchor trailer to the ground or house. - If in a mobile home, check tie downs and evacuate immediately. - Protect your windows. Permanent shutters are the best protection. A lower-cost approach is to put up plywood panels. Use 1/2 inch marine plywood and mark which board fits which window. Pre-drill holes every 18 inches for screws. - Store valuables and personal papers in a waterproof container on the highest level of your home. Remove outdoor furniture, container plants and decorative objects from patios, terraces, verandas and porches. Store them inside so they will not become flying missiles. - Avoid elevators. If at home, stay inside, away from windows, skylights and glass doors. - Keep a supply of flashlights and extra batteries handy. Avoid open flames, such as candles and kerosene lamps, as a source of light. - If power is lost, turn off major appliances to reduce power "surge" when electricity is restored. - Place towels on the window sills to absorb leaking water. Wedge patio doors so they cannot be torn off. - Leave as soon as possible. Avoid flooded roads and watch for washed-out bridges. - Secure your home by unplugging appliances and turning off electricity and the main water valve. - Tell someone outside of the storm area where you are going. If time permits, and you live in an identified surge zone, elevate furniture to protect it from flooding or better yet, move it to a higher floor. - Bring preassembled emergency supplies and warm protective clothing. Take blankets and sleeping bags to shelter. Lock up home and leave. Each May, U.S. government experts issue a forecast for the coming season that provides a range of hurricanes. Below are the ranges for recent years, and the actual number of hurricanes that formed. Nine U.S. states are particularly vulnerable to Atlantic hurricanes. Much of southeast Houston, the largest Texas city along the coast, would likely be flooded if a Category 5 storm hit. Nearby Galveston saw the deadliest storm to strike U.S. soil, a hurricane that claimed up to 12,000 lives in 1900. The area is also near dozens of chemical plants and offshore oil and gas wells. New Orleans and other coastal areas are even more vulnerable than before Katrina, given that many marshes and barrier islands that created a first line of defense from storm surge have been wiped out. Katrina also destroyed New Orleans' levee system, and while much has been rebuilt concerns remain about its effectiveness. Coastal areas are home to half the state's population. Most of the state's 90 miles of coastline, as well as barrier islands offshore, were torn up by Katrina. An area between Waveland and Pascagoula saw storm surges of up to several miles inland that destroyed thousands of homes. The state's southwest coast has the highest concentration of residents in Alabama after Birmingham. While Loisiana and Mississippi got most of the Katrina attention, Alabama also saw coastal destruction and most of the state received federal funds. The state has more coastline than any other, and much of that is built up with resort and retirement communities. The Florida Keys, a string of islands with full-time population of 80,000, are particularly vulnerable since they are just a few feet above sea level. The great Savannah area is home to 300, 000 people and is a major port for cargo ships. Built on flat marshes, the city is vulnerable to flooding and uses canals and pumping stations to remove excess water. Charleston, the state�s second largest city with 115,000 residents, sits at the junction of two rivers near the coast. It was battered by Hurricane Hugo in 1989, with 75 percent of the city's historic district suffering damage from inland flooding. The Outer Banks, a 90 miles stretch of barrier islands, are the first line of defense for the mainland. But the low-lying islands often get battered themselves. Their position makes them the most hurricane-prone area north of the Florida. In the second half of the 1990's, inland areas of the state were hit by a rash of hurricanes, including Floyd, which caused widespread flooding and pollution problems from overflowing hog waste ponds. Though its coastline is small, Virginia has suffered hurricane damage, particularly flooding from rains. Norfolk, with a population of 240,000, is home to the world�s largest naval base, and the Navy always moves its fleet out to sea and safer waters when hurricanes approaches. The U.S. mainland has never been hit by both a Category 4 and a Category 5 hurricane in the same season. Category Five storms, which can generate storm surges higher than 18 feet are rare. Only three such hurricanes have made landfall in the United States in the past 70 years, including Andrew in 1992, Camille in 1969 and the unnamed storm that hit the Florida Keys in 1935. Rita is the 17th named storm of the Atlantic hurricane season, making this the fourth-busiest season since record-keeping started in 1851. The record is 21 tropical storms in 1933. 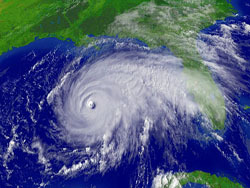 The hurricane season runs from 1 June to 30 November.